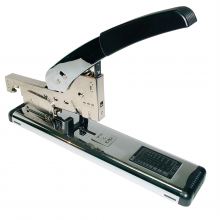 Equipped with removing devices which can easily remove jammed staples. Attached with a stapling location adjusting mechanism. Side window to show the staple size and remaining staple volume. Staples up to 240 sheets of 70gsm paper. Staples Refill : 23/6 to 23/20.